Download your free tip card here. Business communication skills are integral to advancing your career and creating deeper, more satisfying relationships at work. Rarely do business books or management books like How to Say Anything to Anyone come along that provide practical, concrete strategies to improve business communication and positively affect your workplace relationships. Whether you want to learn to express yourself more candidly with colleagues or further cultivate your business relationships with customers, How to Say Anything to Anyone encourages you to bring candor into the workplace, as well as in every relationship in your life. Why waste time and money on stacks of leadership books, business books, or management books? 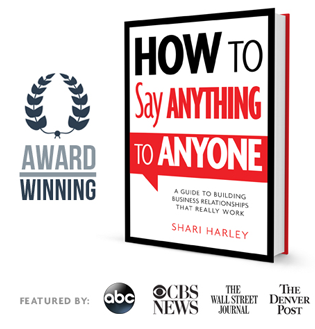 How to Say Anything to Anyone is one of those rare books on business communication, leadership, and management that offers constructive, no-nonsense ways for you to take charge of your career. © 2019 Shari Harley. All rights reserved.